When Sacramento’s summer temps start to sizzle, it is time to adjust your workout routine in order to beat the heat. The best way to reach your fitness goals without frying like an egg on asphalt? Dive in to the nearest pool or lake and experience the incredible benefits of water workouts. Anyone who has been through a Sacramento summer or two knows that access to a pool is a must all the way through to fall. Why just float in the cool, blue oasis when you can get a workout in at the same time? There is an aqua class available for every one of our California Family Fitness members, and to suit every fitness goal. Here’s what an aqua class can do for you. Aqua 101: A low-impact class safe for pregnant women, seniors, new participants, and anyone recovering from injury or surgery. Safely burn up to 250 calories per hour. Aqua Zumba: Splash your way into shape with an invigorating low-impact aquatic exercise. Known as the Zumba "pool party," the Aqua Zumba program gives new meaning to the idea of a refreshing workout. Integrating the Zumba philosophy with traditional aquatic fitness disciplines, Aqua Zumba blends it all together into workout that's cardio-conditioning, body-toning, and most of all, exhilarating beyond belief. Fusion: If you like variety in your workout, you are going to love Aqua Fusion. Mix up power, spin, sports, kickboxing, strength, walking, and running to improve cardiovascular performance, strengthen muscles, and burn up to 250 calories per hour. Power: When you want to strengthen muscles in a fast-paced, intense class, Aqua Power will get your heart rate up while working all your large muscle groups. Strength training in the pool can burn up to 300 calories per hour. Run: A challenging class that will improve your cardiovascular performance, strengthen muscles, and increase your land stamina and power through vertical running. Serious calorie burning that is safe and gentle on joints. Burns up to 500 calories per hour. Cardio/ Strength: Take your cardio and strength routine to the water, and work your entire body in the pool. This whole body workout will improve cardiovascular performance and strengthen muscles while burning up to 250 calories per hour. Treading: How long can you tread water? With this cardiovascular and strength increasing class, your feet will remain suspended above the bottom of the pool for as much as one-quarter to one-half of class time while you perform other familiar moves. Burn up to 300 calories per hour. Intervals: High-intensity intervals done in a pool in ratios of 10 to 60 seconds. You can train your muscles to fatigue, but not failure. If you want to challenge yourself to new levels of fitness, Aqua Intervals is your ticket to improved cardiovascular performance and stronger muscles while you burn up to 300 calories per hour. Performance Swim Training: Are you competing in a local triathlon in Sacramento this summer? Any time you need to get into competitive swimming shape, PST can help you prepare. Customized workouts and professional stroke evaluations can make you more efficient in your next competition. 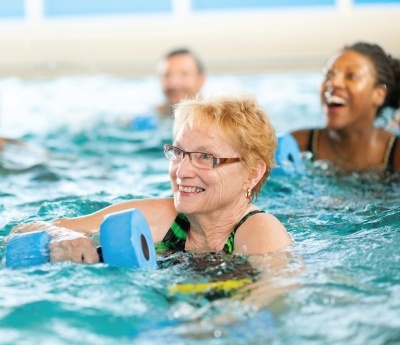 Water fitness classes are great for people of all fitness levels and with a wide variety of fitness goals. Can’t swim? No problem! Lessons are available to you at one of our Sacramento California Family Fitness pools, too. You can survive the triple-digit temps this summer by taking advantage of the cool pools and amazing lakes that are available to you in Sacramento.